News! Winner of 2009 Western Access Video Excellence (WAVE) Award in the category “Talk Show–Issues, Professional Producer.” WAVE is sponsored by The Alliance for Community Media, Western Region, to support and encourage community-access television show producers. Do you have any printable instructions for this home grey water system? What a bright and articulate young man is Trathen. He certainly emphasizes the need to address imminent water shortages–now, rather than when we reach crisis stages. And concerning the public health concerns of various agencies: how many of us do not use numerous detrimental or harmful chemical products in daily living that end up in our water supply? Further, what of those used by manufacturers and governmental organizations themselves? As a person with chemical sensitivities, it is greatly disturbing to me that we have such a disconnect with regard to this. I have learned that I do not (need) any of these household, personal care, and industrial products. For years, I have recognized that I could clear the vast shelf expanse of grocery and other stores of these products as they are unnecessary. Yet advertisers and manufacturers of such products have convinced people otherwise. It did not surprise me to learn that makers of industrial products, seeking to expand their profit bases, then introduced “personal care” products made of the same chemical constituents. Surely it is time for us to concern ourselves with such realities? These are even more harmful to all of the animal and plant life exposed to them than to we humans. 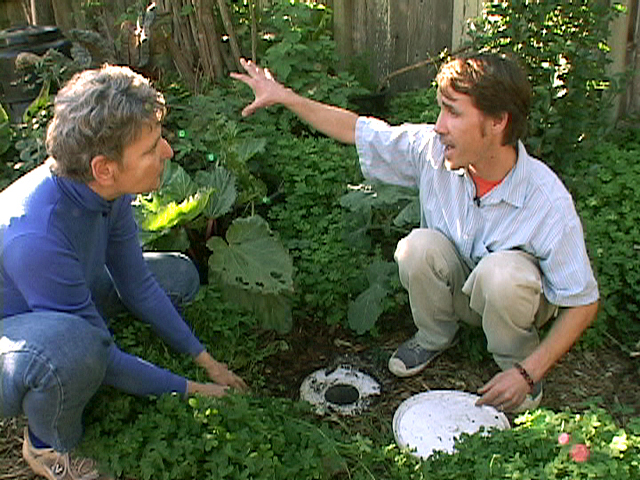 This is an awesome overview of a greywater system! Sometimes negative events like a severe drought can bring upon good. I think we’re going to see greywater recycling be required in the near future on new construction. (at least in the dryer states) Imagine the impact that will make! Hey, could you re-post this video and blog post on our greywater recycling forum? There are quite a few people who I think would really like this video. Our site is http://www.waterharvestonline.com and it’s purpose is to create a place for the water harvesting community to share ideas and encourage one another to live more eco-friendly. That LA Times article was a real eye opener! It’s amazing how many good solutions to major problems are out there. If only the bureaucrats would get off their duffs! Too many people have the idea that gray water is the same as sewage, it’s not. Here in Japan, we use the old bath water to wash our clothes (but we wash ourselves before we get into the bath, so the water stays realtively clean). There’s a fine article in the LA Times about graywater systems, studies which show there are no pathogens in the graywater (despite which the California bureaucracy created over-burdensome graywater codes), the proliferation of “illegal” gray water systems throughout the state, and the need for graywater systems because climate-induced drought is a future ongoing reality. Do check out the resources, the books he mentioned — I think they’ll help a lot, too. Thanks for this awesome little video, many thanks to Trathen for being such a clear and educated and balanced and inspired voice for earth-friendly practices and technologies. We’re designing our house right now, and have greywater plumbed separately, but haven’t quite been able to visualize how we will design our system. This really helps, to see with my own eyes, an example of what’s possible.